Has the rawness of love left you baffled? Has it left you bruised and beside yourself with inexplicable feelings? 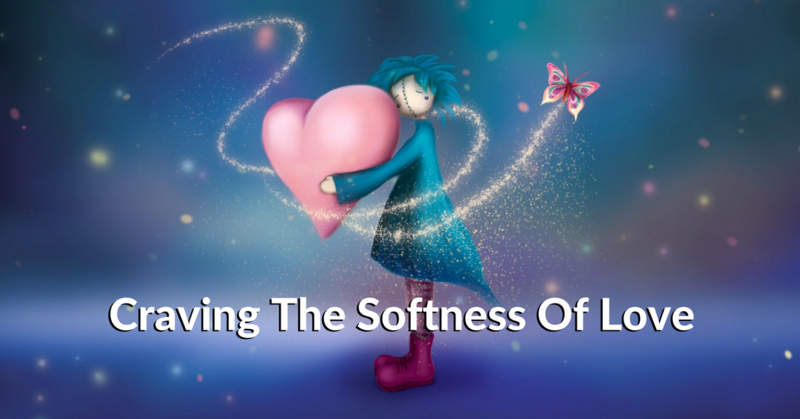 If so, then there’s a good chance that you are craving the softness of love. Perhaps you crave forgiveness? Perhaps you crave kindness..? Tenderness..? Warmth..? Reassurance..? You probably long for a soft place to land and to be soothed and understood? Craving in the emotional heart, just as in the physical body, is a sign of imbalance. Physiological craving is a sign that the nutrients the body feels it needs are missing. Emotional craving is a sign that the nurturing the heart feels it needs is missing. There is also a tendency with craving to look outside… To search for a source. In fact the most painful cravings are often where the source fixated on gives you something you could very well generate yourself and yet you form the habit of getting it from a singular external source which may be in limited supply. For example the body naturally makes nicotine, yet a smoker will crave cigarettes as its source. When the source is not around the cravings can go bananas – shouting and screaming in the body… Demanding that the source be acquired and consumed. This pattern works as much in the heart as it does in the body. One solution of course is to find another, or maybe several other external sources; More drugs, more partners. But ultimately that creates a vicious cycle. Been there. Done that. Got the T-shirt. There’s a thirst, a hunger, a desert-made desperation that comes from a lifetime of seeking and failing. And because I spent so long in that desert myself, I understand that we hide the need… even from ourselves… making it ‘not that important’, ‘not that bad’ or telling ourselves and others “I’ve got it handled”. It can be hard to admit it, but if deep down your heart still aches and craves… you know your kidding yourself. Your own reassuring, tender warmth. It’s at your centre where balance is effortless. Going there may mean you need to meet the powerful emotions that have guarded your gate for eons. Perhaps it’s rage, perhaps it’s terror, perhaps it’s the deepest unworthiness? And meeting them is likely the near opposite of the comfort you’re after. It’s that rawness again. To see it through and meet yourself and the freedom it brings. Or turn back to the false comfort of craving and go round the circle again. One of the great things about having NPA at your disposal though, is that often meeting those deep uncomfortable spaces can be quicker and easier than perhaps you’ve experienced before. In fact the primary hurdle is often the decision you have to make; whether that’s to do it yourself, or with the kindness of help. But if I am what I am seeking will I be alone..? It’s not about you OR relationship. It’s about experiencing a relationship WITHOUT YOU… OR experiencing a relationship WITH YOU. Joel is a well renowned international speaker and teacher in the field of Human Consciousness. With nearly 20 years experience in private practice and working with groups, Joel’s vast experience makes him a master of facilitating release, freedom, healing & awakening. Beautifully written. Goes down like honey. Thank you, Joel. The NPA Process: Do It Right! Is Fear Of Loss Holding You Back In Love? Visit the Main NPA Website: NonPersonalAwareness.com for more information.